Established in the year 2003, we, %u201CBond Well Ortho Products%u201D, are profound organization engaged in manufacturing, supplying and wholesaler a comprehensive range of Orthopedic Instruments. 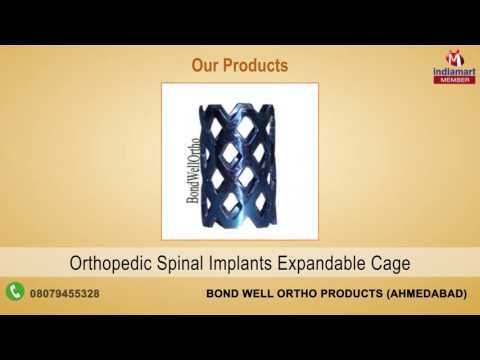 Products included in this range are Spinal Implants,Locking Plates, Orthopedic Implants and others. Products offered by us are manufactured using optimum quality raw material which is procured from authentic sources of the industry. In addition to this, we employ the latest technology and other necessary amenities in designing these equipment, in strict compliance with medical guidelines. Our range is widely appreciated for its dimensional accuracy, robustness, resistance against corrosion, excellent strength, reliable performance, functional efficiency and durable standards.